Republicans won seven of the nine U.S. Senate races that had received the most dark money — money from groups that don’t have to disclose their donors. As of late October, Conservative groups provided 68 percent of the more than $80 million in dark money spent in those contests to help the GOP maintain its Senate majority. 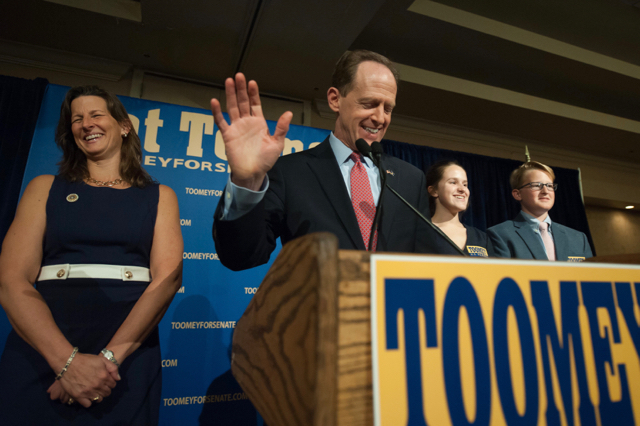 Pennsylvania Republican Pat Toomey won re-election, defeating Democratic challenger Katie McGinty in the most expensive Senate race in U.S. history. The U.S. Chamber of Commerce, the second biggest dark money spender this election cycle, and Americans for Prosperity, a politically active nonprofit founded by billionaire David Koch, poured millions into Toomey’s re-election bid. Ohio Republican Rob Portman easily held onto his U.S. Senate seat. The U.S. Chamber of Commerce and Americans for Prosperity advocated for Portman and against his opponent, Democrat Ted Strickland. Florida Republican Marco Rubio also handily defeated his opponent, Democrat Rep. Pat Murphy. Rubio’s re-election battle had help from the Chamber, the National Rifle Association Institute for Legislative Action (the NRA’s advocacy arm), Americans for Prosperity, and American Future Fund, another politically active nonprofit. Murphy had support from some liberal dark money groups including AFT Solidarity, America’s Voice, People for the American Way and Working America. In Nevada, Democrat Catherine Cortez Masto defeated Republican Joe Heck in a closely contested race for the seat vacated by Sen. Minority Leader Harry Reid. The League of Conservation Voters, the Environmental Defense Action Fund, and Majority Forward boosted Cortez Masto’s bid. Heck had support from the Chamber and the NRA’s advocacy arm. Indiana Republican Rep. Todd Young defeated Indiana Democrat Evan Bayh, with help from the Chamber, Bayh’s former employer. The pro-business trade group, along with the NRA’s Institute for Legislative Action and Americans for Prosperity, boosted Young’s first Senate bid. North Carolina Republican Richard Burr defeated his Democratic challenger, Deborah Ross, with help from the NRA’s advocacy arm, Americans for Prosperity, and One Nation, a dark money group linked to GOP strategist Karl Rove. Ross had some support from the AFL-CIO, which had spent around $900,000 as of late October. Missouri Republican Roy Blunt, the incumbent, defeated his Democratic challenger, Secretary of State Jason Kander, with help from the NRA’s Institute for Legislative Action, Americans for Prosperity, and One Nation. Kander had support from Majority Forward and the American Federation of State, County and Municipal Employees. Wisconsin Republican Ron Johnson held onto his Senate seat, defeating Democrat Russ Feingold for a second time. (Johnson first upset Feingold, then the incumbent, in 2010.) The Chamber, the NRA’s advocacy arm, and Americans for Prosperity have spent to support Johnson. Feingold’s biggest dark money booster was the Environmental Defense Action Fund. The New Hampshire U.S. Senate race between Republican incumbent Kelly Ayotte and Democrat Maggie Hassan was very close. On Wednesday afternoon, New Hampshire Secretary of State William Gardner declared Hassan the winner by 1,023 votes. Ayotte’s bid received support from a number of conservative organizations — the Chamber, One Nation, and Citizens for Responsible Energy Solutions. The National Abortion Rights Action League and Everytown for Gun Safety, which is backed by Michael Bloomberg, spent money to support Hassan’s election.